The committee to establish a comfort care home called Bampa’s House in the Corning-Painted Post area has announced that they will be sponsoring a 5K run/walk at Craig Park in Painted Post, NY. The purpose of the race is to raise money for Bampa’s House and celebrate the life of Jim Dugan, the namesake of Bampa’s House. Jim, who was called Bampa by his grandchildren, was a life-long resident of the Corning-Painted Post area, spending his career at Corning Community College, volunteering through the Lions Club, and facilitating beer tastings at The Site. Participants are encouraged to run or walk the 3.1 mile course that includes the beautiful Painted Post Trail and winds through the streets of Painted Post where Jim lived. There will also be a Kid’s Fun Run prior to the 5K race where children under 10 can participate. NEW THIS YEAR! Team competition: The categories will be Male, Female and Mixed. 4 runners from each team will count…like a Cross Country Race. The team with the lowest 4 places (Total) wins in each category. All proceeds from the race will be put towards the establishment of Bampa’s House. 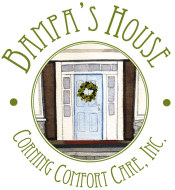 Bampa’s House (Corning Comfort Care, Inc.) is a non-profit organization that focuses on providing a safe and comfortable place for people to receive end-of-life care when home care is not an option. For more information about the race or about Bampa’s House, please visit www.bampashouse.org.